I really didn’t want to have to write this article about leopard gecko diseases and illnesses because it’s kind of depressing to think about. I haven’t ever had to deal with a leopard gecko that had a health problem or anything. But, reptiles usually don’t show any signs of of diseases or illnesses. Leopard geckos are one of the healthiest reptiles. Since they live for up to 20 years they are one of the easiest lizards to own. I did write this article to help anyone that might be concerned about their leopard gecko. If you think it’s something that could be fatal I would encourage you to take them to the vet immediately. Not very alert when your holding them. Almost like they are in a daze and not paying attention to anything around them. Their tail is losing thickness. If the leopard geckos tail is getting very thin they could be getting sick or have a disease or illness. If you have leopard geckos housed together and notice that one of them has dropped their tail the other gecko is probably bullying the other one (see this on leopard gecko tails). You notice that you can see their bones in their body. There bodies should have some thickness to them. They shouldn’t have any bumps or buldges in their stomach. Make sure they are not pregnant if you do notice a budge. Their skin should be colorful. If their skins looks discolored (and they are not shedding), or have blisters or open cuts that is a good sign that something might be wrong with them.Their eyes should be clear. Make sure there is nothing draining out of their eyes or swelling. There shouldn’t ever be anything draining out of their mouth. Their jaw bone should be firm. Their mouth shouldn’t be gaping or anything. This is a sign of MBD (metabolic bone disease). They should have all of their toes. There shouldn’t be any extra skin around them (see shedding problems). If their toes are swelling or bleeding this could be a sign of infection. Their feces should be solid (black, brown, and a little white). Their feces shouldn’t be diarrhea or different colors. Impaction. The number one problem I have seen over the years is impaction. The results of impaction can often be fatal if left untreated. This happens when leopard geckos eat their substrate. There stomach has a hard time digesting the sand, and I really believe calcium sand should be avoided. Also, your leopard gecko can get impacted by eating food that is to big. Prolapse. This is a serious health problem. Basically, an organ is trapped outside of their body. Typically, you will notice a vent under their tail which looks like there is something sticking out of it. Make sure you take them to the vet if you see this. This can be fatal if not treated right away. Egg Binding. This is also called dystocia. This happens when leopard geckos have problems laying eggs. Their eggs are not leaving their body when it’s time to lay eggs. A lot of times this happens because they are not getting enough calcium in their diet. You may notice your leopard gecko straining to lay eggs, is acting depressed, is not eating very much, or is very restless. This can be fatal! Metabolic Bone Disease (MBD). You will notice that your leopard gecko is having problems walking. Their limbs will appear rubbery. It might appear that their limbs are completely broken. This is really one of the hardest diseases to witness as a gecko owner. 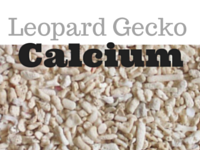 This happens because leopard geckos are not getting enough calcium in their diet. Make sure you are dusting their food with calcium to prevent this. There is no cure reversing MBD once they have it; it just wont progress any further once treated though. Parasites. A parasite is a organism that is living inside of your leopard geckos body. They can have parasites for months before you really start to notice you gecko looking sick. They are pretty common for illnesses for leopard geckos. These parasites are breeding, feeding, and growing inside of your gecko. I know it sounds disgusting. You can tell if you gecko has a parasite by taking a feces sample to the vet. They are treated by medicine that you need to feed to your gecko orally. Burns. Your leopard gecko can get burnt on a heated rocked, pad, or even light. This can be a serious problem and can even be fatal. You can take your leopard gecko to a vet and they can put some topical ointment on them or give them some antibiotics. Hopefully, you never have to deal with any of the problems with your leopard gecko. But, illnesses and health problems are a real problems that a lot of gecko owners are dealing with everyday. It’s best to take them to a vet if you notice anything that is listed in this article. You might not notice the warning signs for quite some time because reptiles do a really good job at masking their illnesses. NextLeopard Gecko Gender – How To Tell? Hi, I have a leopard gecko that is about 13 years old. I believe he has a parasite (shedding problems and losing fatness in his tail). I am going to take him to the vet, and I am glad I read this because they did not inform me about taking a stool sample. My leopard gecko is female, about 13 years old and about the size of my hand. She had a lump on her lower belly for constipation about 4 years ago and healed great. About 2 months ago, she had a hole right in front of her right rear leg. It had just got done healing completely. Last night, she ripped it open and I don’t know why or how to move forward. It’s the largest she’s tore it open and it’s almost the size of a dime now. I cleaned her wound and shes in a sanitary cage at the moment. I used lidocaine wash to help the pain before washing out the sand. She’s moving around fine but she’s also not happy she’s in her travel cage. I have photos that I can send you. Please, any ideas or suggestions would be great. Thank you ahead of time. I just don’t want her to suffer. 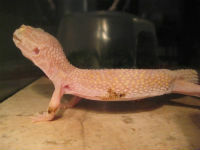 My leopard gecko has a swollen bump on his right front leg – any idea what that problem can be? Seeing that your leopard gecko has an unidentified bump, regardless of where it is located on the body, it is perfectly normal to have concerns. It is important to feel out whether or not the bump is free moving (able to be moved around in the skin) or rigidly stuck in position. In most cases of lumps in lizards near the front arm areas, the lump is actually filled with lymph fluid and calcium. Having these bumps is completely normal for your gecko and simply means that there is a reason behind why he or she is not metabolizing, or cycling through, the calcium right away. That being said, you should always bring your pet in for veterinary care if you suspect something isn’t quite right. Your VMD should also be seen for the routine care visits such as annuals and semi annuals as well for maximum pet welfare. My leopard gecko has something black on one of his testicles and they seem swollen. Is this impaction or something else? I have soaked him a couple times but nothing coming out. My son’s Leopard Gecko’s tail which until a week ago was fat and healthy, has shrunk down some. He is still eating, but he’s not acting his usual curious outgoing self. This morning I found an inch and a half long, 1/2 inch diameter white sack(?) thing where he poops, he’s shedding currently and refusing food today. He last ate 4 crickets two days ago. Any ideas as to what the sacklike thing is and do I need to find a reptile vet for this? Thanks from my son, Indy (the gecko), and me. Don’t panic too much just yet – I think there’s a good chance this could be an unfertilized egg! Your ‘he’ may actually be a she. Have a look at this video on determining the gender. It should be pretty easy to tell (I’m guessing your leo is probably 9+ months old). My gecko has a little gooey spot of clearish stuff in her eye and it’s been there for a while and I don’t want to remove it because I don’t know what it is. If you guys have an opinion of what to do that would help. So my sons pet geck looks just like the one in the picture you described about parasites. Sadly today he is going to the vet to end his suffering. But this arrival of info was helpful to the vet. So he almost cured him. Thank you soooooooo much! I’ve noticed my leopard gecko is developing darkish brown spots all over his body. I’m very concerned because it doesn’t look much like his pattern changing, rather than some type of disease forming.. It sounds like your leopard gecko might have a skin infection. I would recommend keeping your gecko in paper towel substrate. Give him a 20 min soak in 85-degree water for a week. If that doesn’t help you can always take him to a vet. Thanks for letting us know about leopard gecko diseases. I hadn’t really given any thought to this subject as our pet gecko Mordecai is still young. This may be a silly question but can you tell me how do we know if Mordecai is a boy or girl? We weren’t told when we got him at the pet store. I guess if it turns our that our gecko is a boy then I wouldn’t have to worry about egg binding. Also how likely is our gecko to get a parasite? He is in the tank most of the time and only comes out when my son plays with him. This should help in determining the gender of your leopard gecko. Parasites are not very common with leopard geckos. Just make sure you’re cleaning their cage every 2 weeks and feeding them correctly. It is a very sad thing to think of your leopard Gecko having a desease. They, just like cats and dogs, become a part of the family; especially if you bring them out of their habitat and handle them frequently during the day. We handled ours often and even took them to the library, Walmart and other outing during good weather. We were lucky. we had our two for a long time and never had an instance or need to take them to the vet, which was a good thing because we live in a small town that doesn’t have a vet knowledgeable about reptiles. This is a great article. 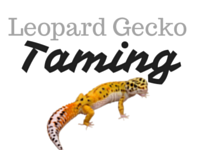 I really didn’t know the different signs of problems that could occur so this post will be helpful for those who currently have leopard geckos. Cool post. You actually are an expert on geckos. I have a question on MBD. If they have it and their limbs and they are rubbery or have trouble walking is there a way to reverse it? Actually, there is no way to reverse it which is very sad. Typically, it will start in their front legs and they will walk on the back of their hands. This is because their arm and hands are fused together. If you start supplementing their diet correctly with calcium the disease will no longer progress. Yep, it’s rare but some females I believe were incubated at a higher temperature so they might have a temper and need to be housed alone.